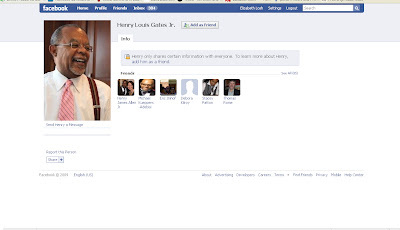 There is a Facebook dimension to what seems to be the racially motivated arrest of noted African-American scholar Henry Louis Gates despite the fact that he produced identification to law enforcement officers to show that he was, in fact, breaking into his own house because the lock was jammed. As Gates himself notes, in an interview with The Root, he took Facebook messages as an important sign of support after his ordeal. This is particularly interesting, since Gates has a relatively modest number of friends indicated on his Facebook profile despite the fact that he is a public figure. Perhaps he was referring to fans of pages started in his honor by others, which have garnered much larger measures of affiliation. It could be argued that Gates mentions the Facebook site, because it has become a marker of social acceptance and legitimation, particularly in academic communities.